Happy Monday! Kitchen Sink Stamps is holding a special challenge for a great cause! KSS is a sponsor for Stamping Out Alzheimer's, you may have noticed the widget on my sidebar. To be eligible to play in the challenge this week, you'll need to make a small donation by clicking on the widget, it's for a GREAT cause, and you'll have the chance to win some great prizes from various sponsors. I hope you'll consider the small donation and play along. In line with Alzheimer's effecting the memory and today being Memorial Day, the KSS Challenge theme is "Remembering". Want to read more about the challenge and what you have the chance to win, click here. 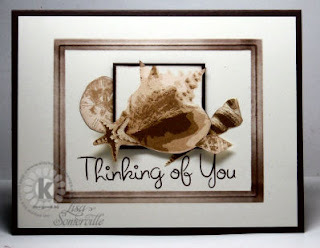 I created a Thinking of You card for today's challenge, using the Kitchen Sink Stamps set 3 Step Sea Shells, the sentiment is from the KSS 3 Step Hibiscus set. Don't forget you can save 10% on all your purchases at Kitchen Sink Stamps when you use code LISA10KSS. The sentiment was stamped in Chocolate Chip Ink, I used a SAMJ for proper placement. The Conch Shell is done using the Out of the Box Technique, I cut out the other images and arranged them around my focal image, popping a few up on dimensionals. 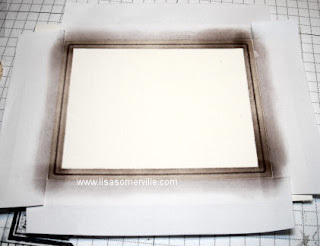 Be sure to visit the Kitchen Sink Stamps Blog to see the wonderful creations created by the other KSS Design Team Members. Thanks for stopping by, I hope you'll check back later, as I have a few other posts scheduled for today. Thank You in advance for your support to SOA! Awesome craftsmanship with these beautifully framed seashells!! Thanks for sharing your technique!! This is to die for beautiuous GF! Make me one? Wow! What a great tutorial! Thanks for sharing your pearls of wisdom. I love how you framed the big conch. Just gorgeous. This is really amazing! TFS! So very pretty, Lisa! You have stamped those shell wonderfully! They look so real!! This is fabulous, Lisa! I love how you did the embossed edges and your shells look amazing!